HomeBlogBackpacksCan school backpacks be washed? Can school backpacks be washed? School backpacks go through a lot of hardships as they are being carried by the careless and ruthless young ones. Children keep backpacks on the floor or in a playground where it can get dirty due to the dirt around. The dirt is not just on the backpack’s surface; it goes into the backpack’s pockets through the stuff kept in the pockets and while the pockets are open. If just the backpack’s surface would be dirty, it could have been wiped with a cloth, but the inside of the backpack can be difficult to clean. However, the first question here is can you wash a school backpack or not? Most of the backpacks are made from synthetic fabrics such as nylon and polyester. These materials can be washed quite easily and can be dried within a few hours. Moreover, several natural fabrics can be washed and are easy to wash too. On the other hand, leather backpacks might be difficult to wash because leather is heavy, and it might get worn off due to excessive washing. Apart from the fabric, there are some features which might not allow the washing of a backpack. One of it is the external USB port to charge mobile phones. 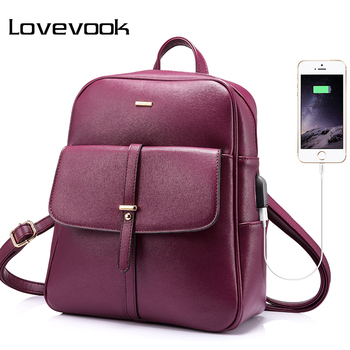 Many backpacks these days including the ‘Anti-Theft Canvas Backpack with USB Charging Port’, ‘Laptop Backpack with USB Charging’, ‘Canvas Backpack for Men and Women’ and ‘Luminous Glow in the Dark Anti-Theft Backpack’ at Gizmoist.com have external USB charging port. Now, you can cover these ports and the internal wire with plastic and wash the backpack, but you should not do it very repeatedly. Another thing which prevents the washing of the backpacks is the solar panel. Gizmoist.com offers some backpacks which have solar panel attached to them to charge the mobile phones. 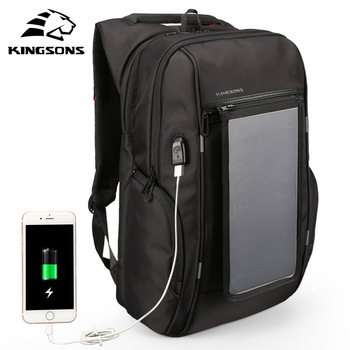 Some of those are ‘Cycling Backpack with Solar USB Charging’, ‘Baibu Solar Backpack’ and ‘Kingsons Solar Powered Backpack’. Solar power is a great utility in a backpack, but it should be taken care of and to do that, it must be prevented from coming into contact with water. Yet again, you can cover the solar panel with plastic, but it is not as easy as to cover a USB port, because solar panels are much more sensitive and bigger than USB ports. How to wash a school backpack? First of all, you must empty the entire backpack carefully. Anything that remains inside would not mostly survive after being washed. If anything, that needs to be put back in the backpack is dirty, you should clean it right away, because you must not put dirty things back into the backpack. Now, you may wash the backpack with hands or in a washing machine. The risk in washing in the washing machine is that the backpack might get damaged or the zips in the bags might damage the washing machine. However, washing machine would give a better result than if the backpack is washed by hands. Now, you should clean the surface of the bag with the use of a brush or a cloth, so that the big dirt gets off the backpack. You should remove any pockets or straps that are detachable and wash them separately. Then, you must rub any prominent marks or stains with a stain remover. Now, you can fill a large container with warm water. The container should easily fit the backpack in it. A detergent of your choice must be mixed in the water and stirred until foam appears on the surface of water. Now, after sinking your backpack into the water, you must rub it properly with hands or using a brush, so that the dirt gets off it. Let your backpack be in water for an hour or two; this would remove as much dirt as possible from the backpack. Now comes the drying part: you need to hang the backpack at a place that is open to sunlight. Drying might take long even a day or two. How to choose school backpack? What backpack should I get for College? Which is the best fabric for school bags? What is a cool\practical backpack for high school?